The simple design of our zip-front sweater hides a 500-year history of wool textiles in Scotland. The unique material--felted lamb’s-wool that’s softer and cozier than synthetic fleece, but with all the advantages of natural wool--is made by Lochaven in the heart of Scotland’s traditional textile district of Stewarton. 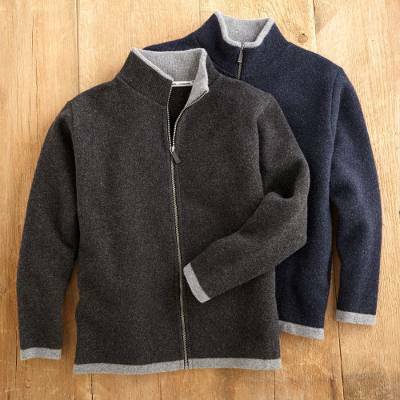 Our grey-trimmed, felted lamb’s-wool sweater is soft and naturally water-resistant, both wind-resistant and breathable. By training young apprentices in knitting, felting, and sewing techniques, they help keep time-honored textile traditions alive and constantly bring new ideas into the industry. They’ve even become a respected costume creator for Hollywood films, including all of the Hogwarts school uniforms for the Harry Potter movies. You can find men's wool cardigan sweater 'Scottish Isles' by National Geographic in clothing categories such as Nat Geo Sweaters, Nat Geo Europe Sweaters, Wool Sweaters and Cardigans Sweaters. Enjoy exploring these sections for other Novica treasures. A wonderfully warm sweater. The zipper is one if the best. Starts easily and is very smooth acting. "His favorite for fall and winter "
Only have had it a week, but it has already become my favorite go to item when feeling chilled. Love it. The jacket is great for me now. I ordered a xxl and got a medium so that's an issue this late in the game at Christmas time. I purchased this because it?s all lambswool and made in Scotland. It?s really a natural fleece rather than a sweater. The felted lambswool is so soft and very warm. Thicker than expected but amazingly light weight. It?s like a gentle warm hug. The wool does ?pill? a bit. Regardless, I think I?ll by one in Navy too.